Now do you see what I mean by “mess”? Okay, let’s take a closer look at this insane route. My friend Zach and I got on the bus at the “32 Sprague Street” stop, which is literally the address of someone’s house. Oh well, at least it was an actual stop. 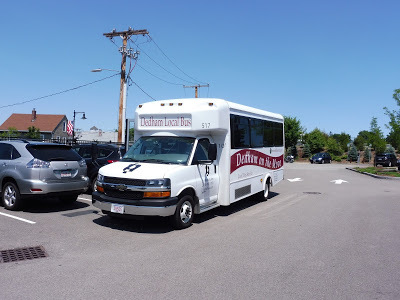 The Dedham Local Bus is also advanced enough to have a tracker, which was useful for seeing where the bus was on Zach’s smartphone. It was slightly late, and boy, that minibus was a beauty. Gotta love that boring serifed font…mmm-hmm. And on the inside? Well, it was the quintessential minibus experience. Let’s see, the driver was blasting inane pop music over the radio, there was a jiggly wheelchair lift in the back. and the lack of stop request buttons meant one had to yell out when they wanted to get off. 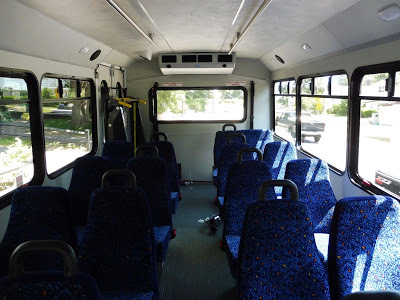 The fares for the route, incidentally, are $1.50 for adults and $1.00 for students and seniors. 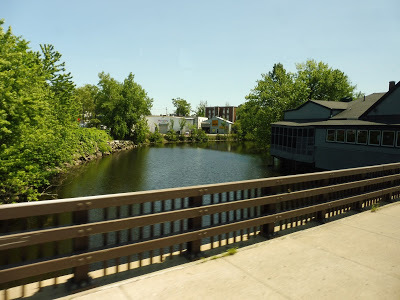 From the 32 Sprague Street stop, we went around a rotary and headed up East Street, going under the Commuter Rail tracks. This was a residential neighborhood, and the houses continued as we turned onto Rustcraft Road. We passed through a short forest section, went by a field, and then the street curved around next to the Commuter Rail tracks. 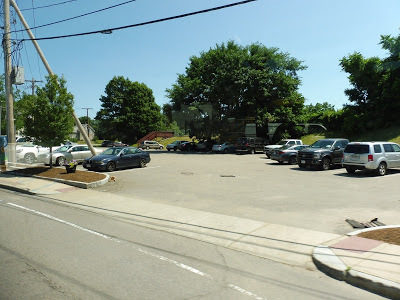 We passed Dedham Corporate Center Station, as well as some apartment developments across the street. The street then became Elm Street and curved north, where we made the first of many deviations of the route, pulling into a backlot at the Legacy Place Mall. And yeah, it’s great that the route directly serves Legacy Place, but how about putting up some signage there? Geez! My camera was acting up inside the mall, so, uh, here’s the sign! 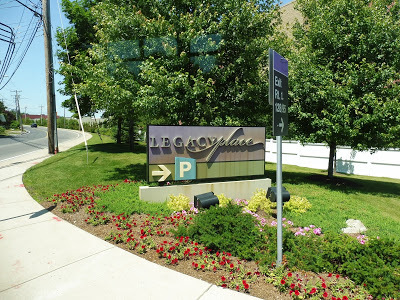 Now back on Elm Street, we travelled along the back side of Legacy Place, then crossed over the wide Providence Highway. Next, we turned onto Washington Street, joining the 34E. 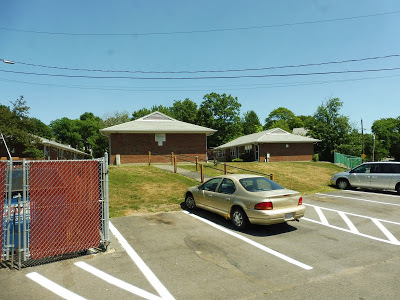 After some houses, we unexpectedly pulled into the Dedham Plaza, but then went around the side of the building to do a loop around the main lot along the Providence Highway. And guess what? No signage. We now returned to Washington Street (diverting from the mapped route, I might add) and continued through a residential neighborhood. Eventually, though, we turned onto Bryant Street, passing by a few offices. 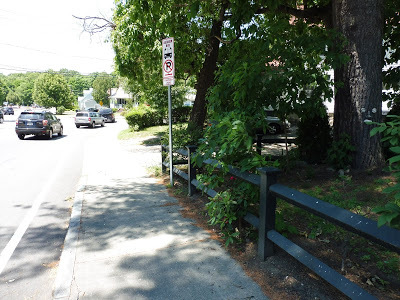 This led to the Dedham Square Municipal Parking Lot, which is considered the start point of the route. We pulled in and laid over for a bit before setting off again. Hmm…seems like a logical place for a bus stop. I hope none of those cars want to leave their parking spaces! 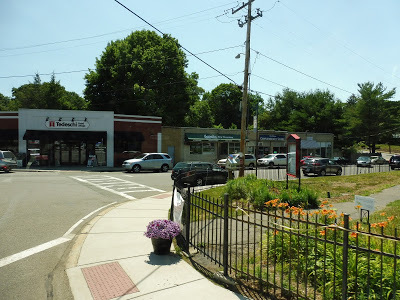 We pulled out and headed down High Street, going by the many businesses of Dedham Square. After some fancy municipal buildings, we turned onto Ames Street, which crossed over the Charles River. There were lots of houses along the road now, continuing as we merged onto Bridge Street. There was a bit of an industrial stretch, then we deviated through a housing development on the narrow and slow Doggett Circle. We passed a mini golf course back on Bridge Street, as well as a small regular golf course. After some offices and industry, we crossed over the Charles again, entering Boston. 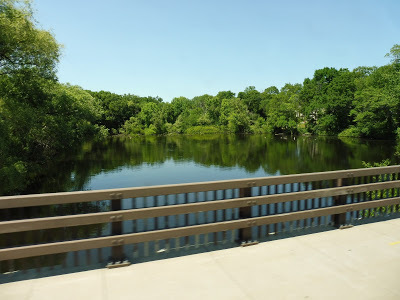 Here, we pulled into the Charles River Loop, where the 36 terminates. There was some traffic getting back onto Spring Street, and then we had to make a left turn onto VFW Parkway, but we made it eventually. VFW Parkway was wide, fast, and very ugly. 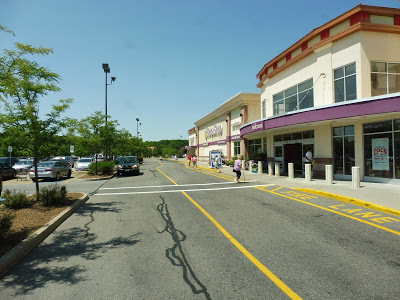 We passed lots of auto dealerships and industrial buildings and the like before finally arriving at the Dedham Mall, where we served the Stop and Shop side. What, too lazy to make a deviation to serve the rest of the mall? The route makes so many unnecessary deviations already, why not have one more? 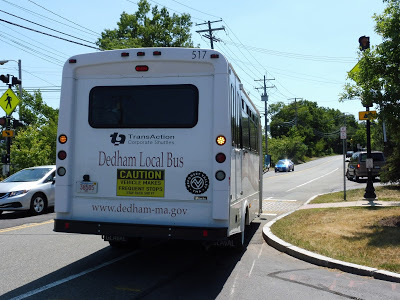 Oh, and did I mention that there’s no Dedham Bus sign? Zach got off here to get a 34E, and now it was just me as we headed back onto VFW Parkway. This took us back to Dedham Square, where we pulled into the lot again and laid over for for a bit more. When we were ready to leave, we went down High Street (the other way this time), which soon became residential. We made yet another deviation into a housing development, this time on O’Neil Drive. It took forever to slowly loop through the complex, but eventually we made it back onto High Street, passing a school. We went by a few more developments (not directly serving them, luckily), then crossed over a small pond. However, it turned out this pond crossing was only to serve yet another housing development. And thus, after making a quick loop, we went right back the way we came. 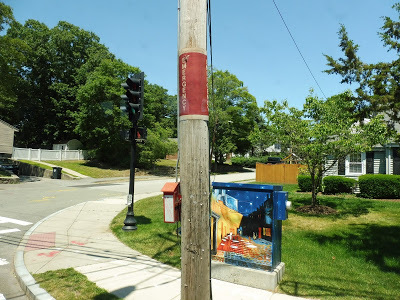 I’d like to point out that the route is supposed to make a second deviation in this area to serve the Motherbrook Community Center, but we didn’t do that on our trip, for some reason. We turned onto Walnut Street, which was mostly residential. 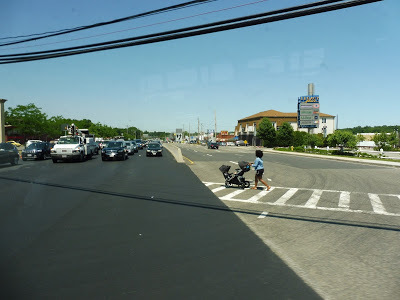 We then merged onto Oakdale Ave, which led to a square of the same name; there were a few cute business blocks there. Now on Cedar Street, the surroundings were all houses once again. A few businesses in Oakdale Square. After a while on Cedar Street, we crossed over the Franklin Line tracks, then turned onto Turner Court. 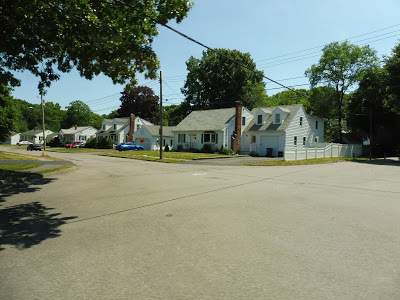 There were more houses, which continued as we turned onto Sprague Street. But was it Sprague Street in the direction of Endicott Station? Nope! We were making another stupid deviation! Luckily, this deviation actually served a purpose. I mean, it was a pretty annoying one, since it involved a full u-turn on the smallish Louise Road, but in the end…we got a rider! HOORAY! 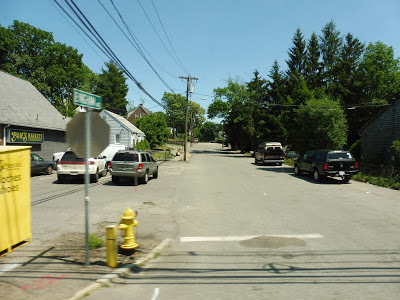 So now, with another person on board, we headed back down Sprague Street, and this time we stayed on it all the way back to Endicott. WOW, that was a long loop. 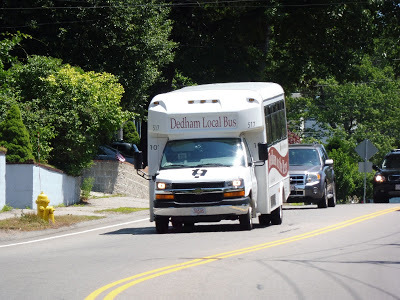 I took the bus a bit further to Dedham Corporate Center, so here it is there. Ridership: Oooh, this one’s a hoot. The route got 9,784 riders in 2014, which equates to an entire 39 riders per day it ran. Wow! Such high ridership! But that was back when the route was more linear. Has ridership increased since they made it a confusing loop with too many deviations? Welp, if the one other passenger on my ride is to judge…no! Pros: Look, the idea of a shuttle in Dedham is a great idea. It really is. There are big chunks of the town not served by the MBTA, so a bus to cover those service gaps is fantastic. In theory. Cons: Here, I’ll be nice and start with a complaint not regarding the route itself: the schedule. The clockface every hour service is sensible, but there are two major problems with the scheduling. Number one is the service gap from 12 to 1. I think it’s meant for the driver’s lunch break or something, but why not just do a driver switch? Can they really only afford one driver? Number two is the fact that the route has no rush hour trips – service runs from 8 AM to 5 PM. Wouldn’t it be great to extend it by one trip on either end in order to bring people from local neighborhoods to the Commuter Rail or MBTA buses for their commute? That seems like it could be useful. Wow…look how much I’ve written without talking about the crazy route. So anyway, about the route: why is it so insane? It’s like the planners were playing a game of trying to put in as many unnecessary deviations as possible! And sure, some of them make sense, like Legacy Place or the Dedham Mall, but they get no ridership because they don’t have signage! Either add signage to every single one of your stupid deviations, or simplify the dang route. This is ridiculous. 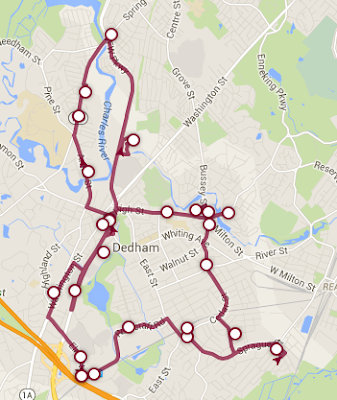 Nearby and Noteworthy: I mean…you can basically get anywhere in Dedham with this crazy route. Will you get there quickly? Nope. But you’ll get there eventually! Is Dedham really suburban enough to justify an insane loop that makes detours to serve every housing development and mall in its path? I mean, sure, it does serve a lot, but most of those detours get no riders, anyway! This route needs signage at all of its stops, and its route needs to be simplified. Do ridership counts! Iron out the detours that don’t typically get people! Oh, and add some commuter trips to the schedule! The basis for a good route is here, but it has way too many problems to be considered adequate right now.